When I was a little kid I was pretty much addicted to marshmallows. I just loved the sticky, gooey texture and consistency, and I liked the understated flavor (marshmallow flavor?). As with many things, though, my childhood marshmallow obsession faded away with age, but after seeing this cool Jell-O-encrusted marshmallow recipe I think that little flame has been reignited. All you need is a pack of plain marshmallows, different flavors of Jell-O, and a bowl of water and Ziploc bag for each flavor. Pour your Jell-O powder into a bag, dip your marshmallow into the water and then toss it around in the bag so that the entire thing gets coated. Then remove it and leave it out to dry. It’s as easy as that! Repeat this as many times as you want with as many different flavors as you want. It gets a bit messy – the Jell-O coloring can stain your skin and it’ll take some furious scrubbing to get off, so I recommend wearing gloves or using a tool to avoid rainbow hands. After about two hours of drying you’ll have a beautifully colorful assortment of fruit-flavored marshmallows that have that nice little bit of crunch on the outside. This an awesome party food that is nut free and delicious! Thank you so much for posting. I am making these for my kids birthday parties and probably will every year.They loved them. 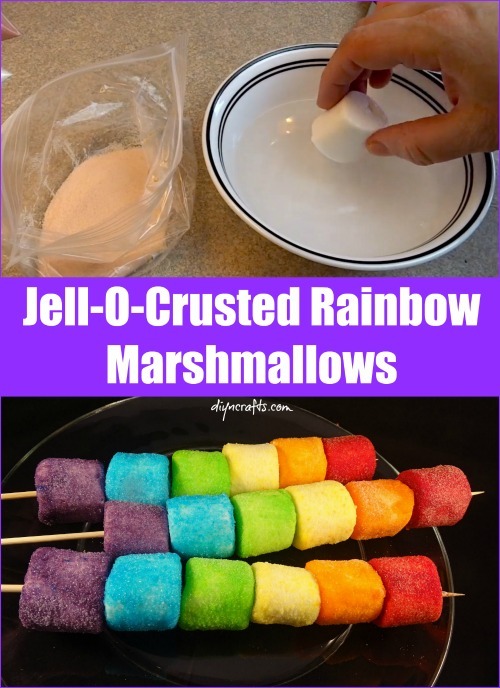 Hiw many marshmallows can be made with a 3 oz box or a 6oz box of jello?